A principality (or princedom) can either be a monarchical feudatory or a sovereign state, ruled or reigned over by a monarch with the title of prince or by a monarch with another title within the generic use of the term prince. Most of these states have historically been a polity, but in some occasions were rather territories in respect of which a princely title is held. The prince's estate and wealth may be located mainly or wholly outside the geographical confines of the principality. Generally recognised surviving sovereign principalities are Liechtenstein, Monaco, and the co-principality of Andorra. Extant royal primogenitures styled as principalities include Asturias (Spain), and Wales (UK). The term "principality" is often used informally to describe Wales as it currently exists, but this has no constitutional basis. The Principality of Wales existed in the northern and western areas of Wales between the 13th and 16th centuries; the Laws in Wales Act of 1536 which legally incorporated Wales within England removed the distinction between those areas and the March of Wales, but no principality covering the whole of Wales was created. Since that time, the title Prince of Wales (together with Duke of Cornwall and Duke of Rothesay, among other titles) has traditionally been granted to the heir to the reigning monarch of the United Kingdom, but it confers no responsibilities for government in Wales. The Principality of Catalonia existed in the north-eastern areas of Spain between 9th and 18th centuries, and based its sovereignty in the "Constitutions of the Principality of Catalonia," until the defeat of the Catalans in the succession war for the throne of what (at that time) were commonly named as "the kingdoms of Spain" (1701-1714). Principality of Asturias is the official name of autonomous community of Asturias. The term principality is also sometimes used generically for any small monarchy, especially for small sovereign states ruled by a monarch of a lesser rank than a king, such as a Fürst (usually translated in English as "prince"), as in Liechtenstein, or a Grand Duke. No sovereign duchy currently exists, but Luxembourg is a surviving example of a sovereign grand duchy. Historically there have been sovereign principalities with many styles of ruler, such as Countships, Margraviates and even Lordships; especially within the Holy Roman Empire. Notable principalities existed until the early 20th century in various regions of France, Germany and Italy. FÜRST - German title of nobility, usually translated into English as prince. Line of succession to the Monegasque throne - Wikipedia. Co-Princes of Andorra - the two rulers of the Principality of Andorra. GRAND DUCAL HOUSE OF LUXEMBOURG - constitutes the House of Luxembourg-Nassau, headed by the sovereign Grand Duke, and in which the throne of the grand duchy is hereditary. 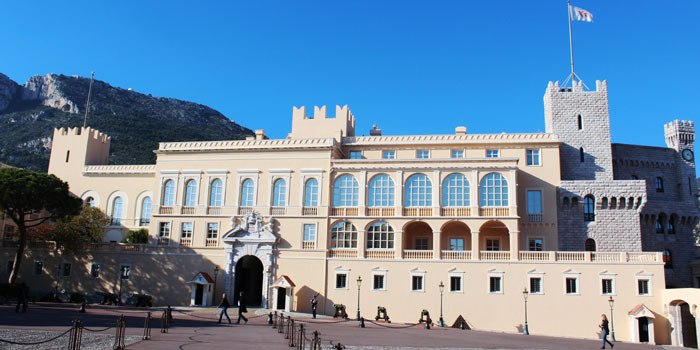 PRINCE'S PALACE OF MONACO - official website. Principality of Andorra - Wikipedia. THE PRINCELY HOUSE OF Grimaldi - associated with the history of the Republic of Genoa, Italy and of the Principality of Monaco. THE PRINCELY HOUSE OF LIECHTENSTEIN - Liechtenstein dynasty, from which the principality takes its name, is the family which reigns by constitutional, hereditary right over the nation of Liechtenstein. The Princely House of Thurn and Taxis - German noble family that was a key player in the postal services in Europe in the 16th century and is well known as owners of breweries and builders of many castles.